It probably feels like you’ve been brushing your teeth your entire life. 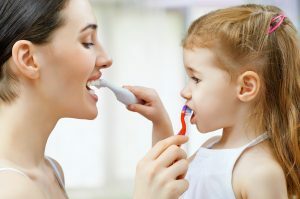 Most people can’t actually remember when they learned to brush, and parents are always more than happy to share stories about chasing you around the house with a toothbrush in hand. Despite being so familiar, most Americans actually brush their teeth incorrectly, leaving them vulnerable to numerous dental problems despite practicing consistent oral hygiene. Fortunately, just keeping a few small details in mind when you brush can help you get the most out of your daily routine, and today, a dentist is going to share a few of them with you. When it comes to the debate between manual or electric toothbrushes, our practice highly recommends Sonicare brushes for their ability to completely eliminate plaque from the teeth. Also, some people believe that a hard-bristled brush will clean the teeth more effectively, when in reality it can just injure the gums and even wear down the enamel. over time A soft bristle brush will do just fine and also make brushing feel much more comfortable. Most people think they brush longer than they actually do. According to research, people spend on average about a minute brushing while the recommended amount of time is at least two minutes. This can be hard to keep track of in your head, so an easy strategy is to just set a timer on your phone or a nearby clock. You should also brush at least twice a day, once in the morning and once right before you go to bed. Simply moving your brush back and forth can cause your gums to recede and your teeth to become more sensitive over time. Instead, brush your teeth at a 45-degree angle and in a slight circular motion. This will do a better job of breaking up plaque and food particles while keeping your smile safe. Because most people don’t really think while they brush, it’s easy for them to miss large areas of their mouth and not even realize it. Make sure you’re brushing all three sides of every tooth (the front, back, and chewing surface) every time. An easy way to keep track of this is to divide your teeth into quadrants: upper-left, upper-right, lower-left, lower-right. Spending about 30 seconds on each should be plenty of time to brush all of your teeth. Toothbrushes (or brush-heads) don’t last forever and should be switched out about every 3-4 months. Once the bristles start to bend outwardly like flower pedals, it’s probably time for a new one. You should also be sure to replace your brush after you’ve been sick, as bacteria and germs can easily remain on it. When you follow all of these little guidelines, they will drastically improve your brushing routine and make your teeth so much cleaner, which will keep them healthier over time. Of course, if you need more tips about how to enhance your home routine or which products you should use, you can always consult your dentist at your regular checkup. Between effective brushing (and flossing!) at home and regular visits with your dentist, you should enjoy a problem-free smile for years to come. Dr. Masha Kogan is a general, restorative, and cosmetic dentist based in Westport, CT. At her practice, she provides comprehensive dental services in a warm and welcoming atmosphere that’s perfect for the entire family. To get more tips on how to take care of your teeth at home, or to schedule an appointment, she can be contacted through her website.